*Cold- Dog winter wear is not just for fun. If it's too cold for you to be outside for more then a few minutes without your coat, it's likely the same for your dog. Some breeds are more protected than others with thicker coats of fur, but always ears, paws and tails should be considered too, so as not to get frostbite. They're not protected by dog winter coats, so never leave your pooch outside too long in the cold. It's also important to keep long paw hair clipped short to reduce the snow buildup. *Allergies- Some dogs have more severe allergies during the winter months than any other time. This is due to the amount of time they spend inside in homes with potential allergens. Ears and skin (might notice rubbing, chewing and licking causing bald spots) are common bodily locations to see winter allergies. *Supplies to have on hand during the winter- extra food, warm pet bed, medications, dog snow boots, heated water bowl (if one is kept in a freezing location), id tags, pet safe ice melt. *Grooming- Keep up with proper, regular grooming during winter months to ensure the coat is in good condition for maximum cold protection. Never allow your dog outside after grooming until completely dry. Also use gentle shampoos to help your dog's skin maintain it's natural protective oils. *Cars- Never leave your dog in a car unattended in the freezing cold. If the car is off, it becomes very cold and if it's left on, carbon monoxide becomes a threat. *Exercise- Keep up with your dog's activity and exercise, but be mindful of older dogs being more achy or stiff during colder months, and ice can be particularly troublesome for arthritic dogs to maneuver on. Warm beds or blankets are helpful after a colder workout. *Burns- Dogs trying to find warmth might get themselves too close to radiators or fireplaces. Keep pet bedding a safe distance from surfaces that are too hot and be on guard that your pet isn't snuggled up too closely to anything that will burn them. PLEASE- do not leave your dog to live outside, especially in winter months. If it's too cold for you, it's too cold for them. 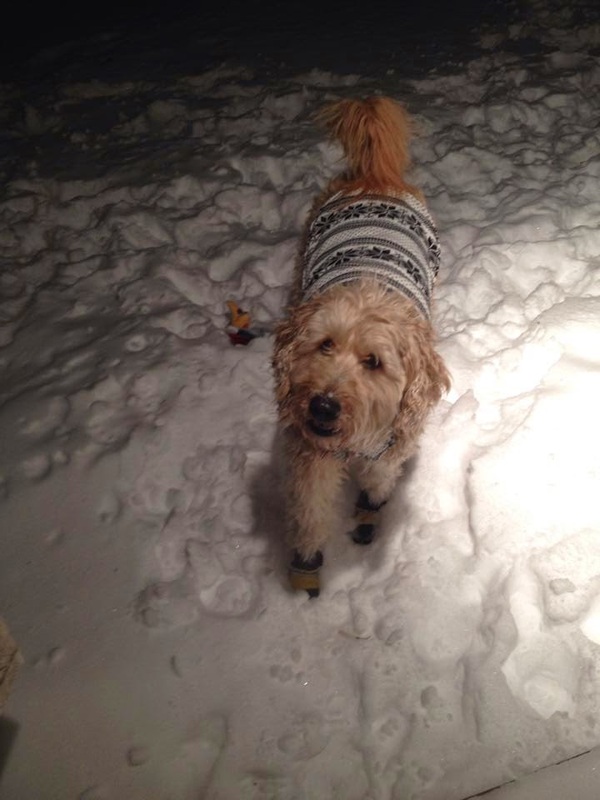 Sweater, boots and a toy...for winter play! Great post and great reminders!! Thanks for sharing! WOW! We're glad it doesn't get that cold here. We have enough trouble dealing with the heat! Great post....we been getting outside for about 20 minute trips...and our water bowls goes in and out with us......Mom has towels ready to dry us off and blankets laying in our beds....or we cuddle with Dad on the recliner!